Every aspect of life must be completely laid upon the altar, and this is primarily the concern of Impatience and Idolatry. 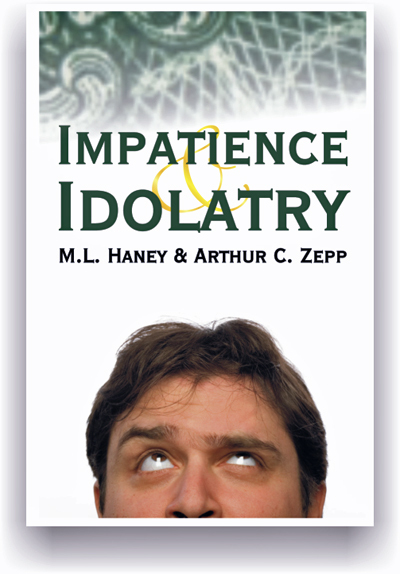 Milton L. Haney warns against impatience as the cause of a host of social ills, a hindrance to salvation every time an unbeliever observes such behavior in a Christian. However, he also shows the remedy for it. Arthur Zepp (Author of Progress After Entire Sanctification) cautions against the insane drive for riches as money-worship. Carefully differentiating between legitimate business and naked ambition, he demonstrates the various sorrows in pursuit of wealth, and points out how the needs of others are trampled all too often. “That is the world’s cry: self…” Here is the connecting thread of this book: worship of Self. At all costs, it must not be allowed onto the heart’s throne. This book warns against two of the methods through which the soul’s throne room may be invaded. Here is a volume filled with power and blessing for the child of God who is motivated by a desire to please his Master.